Calvin James Holman (1827-1900) was a prolific inventor, a holder of numerous (at least 12) US patents for various devices, like sawing machine, vehicle spring, hand truck, sad iron, vehicle wheel, folding umbrella, etc. One of his patents (US153826) from 1874 is for an adding machine. The patent model of the device (up to 1880, the US Patent Office required inventors to submit a model with their patent application) is still preserved in the National Museum of American History, Washington, D.C. (see the images below). 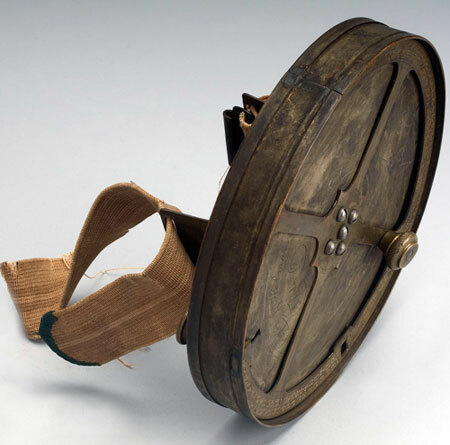 The adding machine of Calvin James Holman is a brass and cloth device with overall measurements: 8 cm x 15.6 cm x 15.6 cm. The round device has a cylindrical case that contains two concentric rotating rings (disks), each with 100 divisions (the digits from 0 to 99) engraved evenly around the edge. The outer, lower ring, with digits representing hundreds, is slightly larger than the other ring. 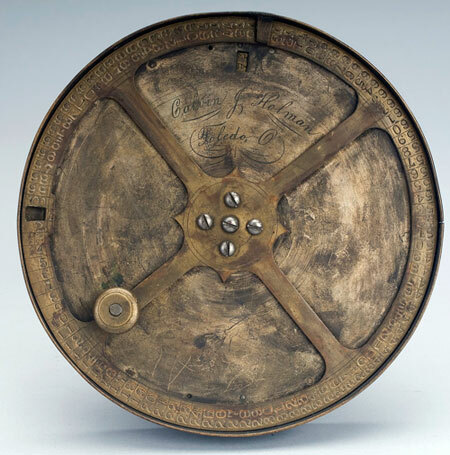 Atop these is a metal disc with two adjacent windows, which make it possible to see the digits on the discs below. On top of this disc is a flat ring with four spokes that hold it together. This ring is the size of the lower ring, and it also has 100 divisions around the outside, which are engraved with numbers. There is a window at 1 that allows one to see the disc below. This spoke has a small knob for rotating it. Rotating this ring so that a number on it is opposite a stop projecting over the ring adds the number to the total already indicated. When the inner makes one revolution, then a carry will be transferred to the outer ring by means of a spur-wheel. There is also a knob or handle on the bottom of the machine for advancing or zeroing the hundreds ring, as well as a strap of cloth for carrying it. Who was the inventor Calvin Holman? Calvin James Holman was born on 30 Oct. 1827, in Onondaga, New York. He was the son of Jonathan Holman (1790-1855) and Lucy "Susan" Townsend (Greenleaf) Holman (1793-1883). Calvin had 5 brothers and 5 sisters. Calvin Holman married to Adelia A. (Offensend) Holman (b. 1834), and they had 3 children: Emma "Della" Adel (b. 1853), Delvin Frank (b. 1855) and James "Jarvis" Harlo (b. 1858). Calvin Holman and his family lived in various towns in Wisconsin (Oshkosh), Ohio (Toledo), before to settle in early 1880s in Chicago, Illinois. He was the proprietor of a mill, the owner of a spring manufacturing business, and had substantial holdings in real estate. Calvin James Holman died in 1900 in Chicago.